Just bounce to FABRICLIVE 56: Pearson Sound / Ramadanman from Fabric London on Vimeo. 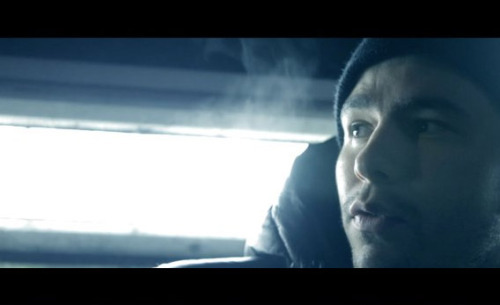 Chrissy Murderbot ft. DJ Spinn - Bussin Down from Jon Sands on Vimeo. Our next Brain Juice night is part of the Vintage Generation festival so our residents will be digging in the crates unleashing some of their influences, from Hip-hop to UK Garage, Jungle and Old Skool Rave. Hailing from Shoreditch it’s easy on first glance to see how Mikill Pane has been credited with leading the charge of Hipster Rap for the UK, but besides the fixie bike, hi-top and impeccable footwear there’s also plenty of substance to go with the style and his underground poetics are intelligent, amusing, socially relevant, outrageous and occasionally rather rude. Making music since 2006, one half of The Sweet & Tender Hooligans with producer extraidinairre Deemo. Together they released an 10 Track EP called “Bobby Caldwell…It Was Really Nothing” which earnt them weekly airplay on Adam Waltons Radio Wales Introducing Show where their single “Pretty Eyes” was selected as one of the tracks of 2008 on his end of year show along with a Live Session which was described by the man himself as “Classic”. Along with this, Louis has appeared on 1xtra alongside Secondson & played various live sets around the UK backed by both Deemo & DJ Killa Tomato supporting the likes of Ugly Duckling, Jehst, MC Xander… Dynamic, entertaining and singular, Louis’ music is quite simply the your modern day soundtrack.\ Here's a few tracks off his Money Making Brothers Mixtape alongside DJ Killer Tomato. Kaptin will be playing elsewhere in the festival too, doing a tribute to the British Reggae scene tomorrow (Thursday 24th) alongside the legendary DJ Derek, Love + Harmony Sounds and Big Crumb, plus an Electro Swimg set with the Big Swing Soundsystem alongside our gentlemanly brethren, The Correspondents, who have just dropped this video for their new single 'What Happened To Soho'. 'What's Happened To Soho?' by The Correspondents from Sentinel Productions on Vimeo. Another fantastic tribute to Nate Dogg from Richard The Third. Big shout to everyone who has brought the 'Genik Riddim' single from our boys Stagga, Skamma and Joe Blow so far, it's certainly not the last you've heard of them all. The new Stagga album will be dropping at the end of next month on Rag & Bone Records but we'll tell you more about that soon. For now check out the latest Low End Theory Podcast from Gaslamp Killer and Jon Hopkins, that includes both the excellent new Stagga and Doshy track 'Hornets', as well as his next forthcoming single on Slit Jockey 'Wild For The Night'. HavocNDeed, who dropped a slamming remix on the 'Genik Riddim' single have kept up working with Skamma and Joe Blow and have just droped this new track which you can buy on Juno Download. Plus the pair's fellow Squid Ninja Lou Hekla has given the mic a bit of a rest but has been stepping up his beats game in the meantime. Here's his latest. Banging 7 Gram Beats... Cause That's How We Roll. 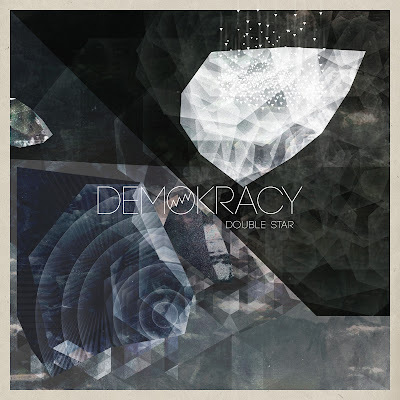 First up is a pretty epic intro from the new Demokracy EP ‘Double Star’ on Robox Neotech, as we’ve come to expect from both the label and the artists, the EP is a cinematic affair, a dystopian robotic future falling apart through stuttered drums and mutant funk. Here’s a free non EP track that gives a little more insight to their sound for the uninitiated. Next up is the Boson remix of Welcome To The Zoo. Having had one of this blog’s biggest hits with his Ginuwine remix some time ago, it was a pleasure to randomly have this turn up via the Astroid Boys as a mix for the EP. This is perfect festival Dubstep, big and bashy but with a wicked little Gypsy, Carnivalesque skank to it. The single is out March 25th, will be dropping a little freebie for you soon but just incase you haven’t seen the video to the original yet. Props to our amigo Troublemaker who dropped this expletive laden revamp of the Rusko monster into my lap just half hour before we had to leave. He jumped straight back into the studio and cleaned up Killer Reese One’s filthy mouth just in time to drop it on the show. Here’s the original (remix) in all it’s glory though. Jazzsteppa have just dropped their ‘I-doser’ EP on Studio Rockers this week and it somehow manages to capture the energy and creativity of their highly impressive live shows into recorded form. Collaborations come from: London based singer Jessie Lee Burn on the jazzed up hyper blend of, 2 Step, Breaks and UK Funky title track; Borgore on the hard hitting heavyweight champion track ‘Shamen’; and the track from the show which features Israeli ‘alternative pop’ star Efrat Gosh on a Bass blasting blues / G funk excursion. Here’s a cheeky little Drake / Rihanna Bootleg. We never quite know what to expect with an Om Unit release but it’s pretty much guaranteed to be quality. There’s a classic late 80s techno feel to the latest EP from which we opted for the excellent Salva remix of 'Prawn Cocktail' which takes the track’s 808 beats and flips them into a Glitch hop / Dubstep hybrid that floats rather more freely than the urgentish pulse of the original, which you can grab courtesy of XLR8R Magazine below. Kovas passed through the studio to chat about the last 64Barmusic mix and release and play us one of his tunes from it. During the interview I scandalously talked over the whole of a track from Blue Daisy (all I had to hand at the time) and half of one from Exotope, sorry boys. Here’s both tracks in all their glory to make up for it. Me and some friends once spent hours looking for a club we liked in London, when we turned up we were told it was Iranian Disco night and that the chances of our over active teen loins being even slightly appeased were zilch. However, if the music was as good as this Iranian Techno that Sticky K sent us, who would have cared (okay yes I know he’s taking the piss with the tag somewhat, but where would the story be then, does sound just a little like Omar Souleyman from a couple of country’s over in Syria mind). Anyway, it’s his forthcoming single and if you still haven’t listened to the show yet, it goes like this. My mate Shane recorded a track with Bassclef whilst he was visiting Cardiff. Not sure what’s going to happen with the tune but it’s rather fun, so we played it on the show and here’s a copy for you guys. Not sure if we’re allowed to give you the amazing remix of MJ Cole & Wiley’s track ‘From The Drop’ by Tru Thoughts and former Ninja Tune artist Hint, but if we get the green light it’s yours. We can (almost) definitely give you this dope re-edit of Skream’s rave-tastic Cassius remix from I Killed Kenny though. We’ve been meaning to do a proper review of Central Spillz debut album Space Travel for a while, and we will. So let’s not waste all the words we might use in that now, just know its bloody good. We played the original of their track Centraleyez but they’ve also given us an exclusive J Suave remix to pass to you lot. We’ve not heard anything from Akira Kiteshi (or just Kiteshi now it seems) for a little while now but a most welcome return has come in the shape of his suped-up version of the rather Scandinavian sounding track ‘Drive’ from South London band Alpines. 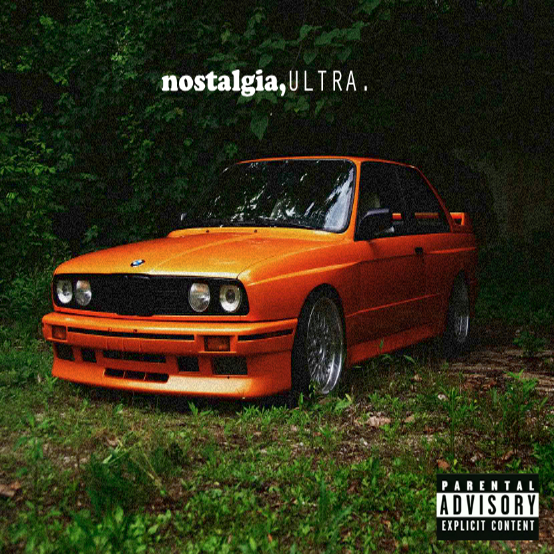 Pretty sure I’ve never played any of the Odd Future Wolf Gang Kill Them All lot on the show, mainly because they’re not forthcoming in handing out radio versions, but their most soulful of members Frank Ocean keeps his mouth clean long enough for me to drop this stunning R’n’B number off his album Nostalgia/Ultra. Unfortunately we misjudged and had to cut off the beautiful Fatima / Floating Points track Relight almost as soon as it dropped, well short of its full 10 minutes. Definitely suggest picking it up when it drops on Eglo records though. And that was the show, you actually listened to it yet? Until next week. 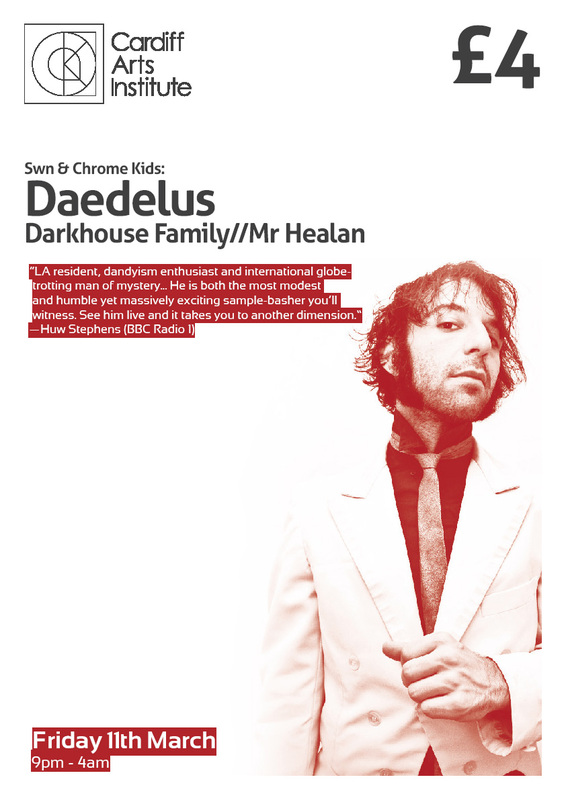 To celebrate the fact that Daedelus shall be coming over to see us on March 11th we are giving away 2 pairs of tickets to the gig (which also features Darkhouse Family and Mr Healan - whose new mix has been firmly lodged in our CD player for a few days now) as well as 2 signed copies of 'Love To Make Music To' which the lovely chaps at Ninja Tune have kindly given us. To enter the competiton (UK only sorry guys, we're skinflints on postage), simply tell us which Daedelus album name checks a region of Wales. Read a great Daedelus interview with the Electronic Music Wales blog. Alternatively if you don't want to risk not winning and missing the show, you can buy tickets.